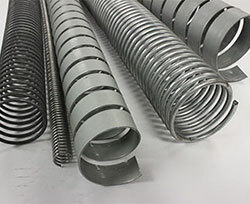 Rockford Spring Co. has produced many varieties of hose guard for over 50 years. We have used that experience to develop very efficient, cost effective processes for manufacturing hose guard. Our hose guard department has all the capabilities for coiling and packaging to meet or exceed all of your hose guard needs. Our hose guards are custom made to your specifications using both round wire and galvanized flat stock. Hose guards can be ordered cut to size up to 25 feet in length.